My thanks to Librarything's Early Reviewer Program and to Bloomsbury for this book. 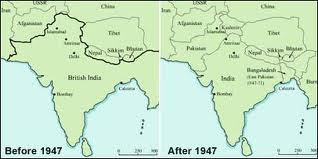 A bit of background first: The partition of India in 1947 and other political considerations made at the time led to violence, "long-term border tensions, infrastructure problems, and the lasting conflict over Kashmir." Kashmir is still an area in conflict, and as the author notes, India and Pakistan have "fought four wars, three of them over Kashmir." 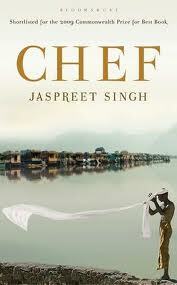 And it is to Kashmir that the main character, Kirpal Singh (Kip) is heading after 14 years away. The bulk of this story, told mainly in flashback, occurs while Kip is on a train from Delhi to Kashmir. The story flashes back and forth in time. He's been asked by General Kumar (who to Kip is General Sahib) to come back to Kashmir to head up the cooking for his daughter's wedding. Kip worked for Kumar first as an apprentice to his chef Kishen, and then as chef, joining the military after his father had crashed his military aircraft into the Siachen glacier. Kip had thought he'd seen the last of Kashmir, but now he is dying from a brain tumor, with only a few months left to live, but accepts this call to his "last battle." Foreigners have colonized us for a long time...Now it is our turn. We will take their food and make it our own. but once again lost his job after cooking for several Muslim clerics at an important function. His punishment: he was sent to the front at the Siachen glacier. Food is another main theme and provides images that run throughout the story -- tortellini becomes a woman's navel; spices provoke memories, a mango is a strong reminder of Kip's father. According to Kishen, a cook cannot get "stuck inside nationalities", and should allow for "dialogues between our methods and the ingredients from the rest of the world." Yet now Kishen is stuck on the glacier, eating precooked and canned food, instant noodles and juice in a package, walking on chocolate to gain traction in the ice. Although Kip is in the army, he's somewhat sheltered in Kumar's kitchen, but eventually his encounter with a Pakistani woman accused of being a terrorist draws him in closer to what's happening on the outside. Kip, who has been trying to lose his virginity throughout, becoming involved with women in absolutely hopeless situations, gets in head over heels with this woman. He begins by serving her food when he meets her in the hospital, and under orders to find out everything he can about her, he comes to realize that her life in Pakistan was "worse than death." But again Kip's life is destined for sadness -- eventually resulting in him leaving Kashmir, until he is once again summoned by now Governor Kumar. Chef is a beautiful novel on several levels, but what strikes me about this novel is how the small-scale conflicts of every day living tend to reflect what's happening on the larger scale of the ongoing war. But at the same time, Kip knows how his world is going to end, unlike those people both actively at war and those innocently caught up in this constant conflict; yet ultimately, everyone has to go on living, just waiting for things to play out. The story will capture your attention and your heart. Most highly recommended for readers of literary fiction who prefer a more thought-provoking novel. And for a glimpse of what's really happening in Kashmir, this month's London Review of Books will help you out in this article. I always worry about books where the main character is dying, but your review makes this one sound very compelling. Thanks, Nancy! I'm the same way -- I'm not into a lot of sweetish sentimentality, so I actually held on to this book for a month before making myself read it. I was actually pleasantly surprised. @BookQuoter: I must not have gotten it or I stupidly rejected it by accident with my Iphone. I've been doing that a LOT lately. My apologies. LOL. I was feeling neglected for a while. I think I said, I like your review of the book and I think I will read it, and I know I definitely said I like your new photo! I've been keen on reading this book for quite a while. Indo-Pak partition is a topic I am interested in.